Following the departure of J.J. Abrams from the director's chair after the theatrical release of Star Trek Into Darkness in 2013, all Trekkie eyes are on celebrated filmmaker Justin Lin of the Fast & Furious franchise as the impending release of his Star Trek Beyond looms ever closer. As evidenced by the film's initial teaser trailer, Lin and company appear primed to deliver a more loose and fun take on the Gene Roddenberry science-fiction property than either of the two preceding entries in the rebooted Star Trek movie continuity. Despite whatever misgivings some die-hard fans of the series might still hold against the featured tone represented by all of the footage that has been released thus far, the cast and crew behind Star Trek Beyond look ready to stand-up for Lin's latest entry in the long-running science-fiction genre favorite. On that note, actor Idris Elba (The Jungle Book) has recently come forward to discuss his role in the new movie as the central antagonist: Krall. "What’s interesting about him is that he has a real beef with what the Enterprise stands for. Krall’s a character who’s deeply steeped in hatred, in my opinion, a well-earned hatred, for the Federation. It felt quite political. There’s a relatability to what’s happening in our world. Not everybody’s happy with what everybody calls the good guys. There’s some history that we explore, to understand why he feels the frontier needs to push back. There’s definitely an opposing argument to the good that the Federation think they do. There are purists that believe in independence, and believe that we’re all made differently for a reason, and will fight tooth and nail to defend that." It would have no doubt been of some interest to fans of the original 1960s Star Trek TV series if Krall were in fact a Gorn, as that would have given rise to an updated Kirk versus Gorn battle sure to bring a smile to many an aging Trekkie's face. 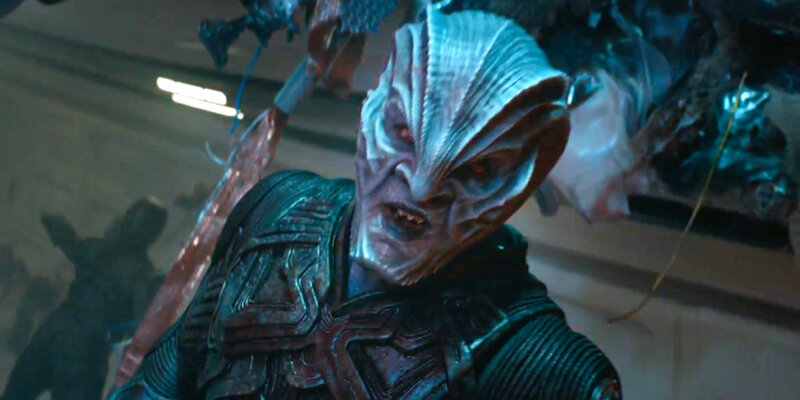 However, the invention of an entirely novel alien race for Lin and company to explore in Star Trek Beyond might yet yield an even greater end result, as such an inventiveness could very well prove fruitful in the making of a contemporary genre satire of the present political climate (both domestically and abroad), as Elba so incisively points out. NEXT: Star Trek Beyond Trailer #2 Next Month? Star Trek Beyond will open in U.S. theaters on July 22nd, 2016.